As gaming pipelines are constantly evolving, Toon Boom is breaking the boundaries of how to create 2D animation for games. When creating character rigs and animation for games, there are a few things to think about before starting. Artists and programmers should work together to make sure their needs are met. • What platform will your game be going on? Windows, Mac, Mobile, iOS, PS, XBOX, etc. • What game engine will you be using? • What is the style of the game? Hand drawn, cut-out, with textures, etc. These are just a few of the questions to consider before getting started. They all have an impact on how you design, build, and animate characters. • Rig and animate characters in Harmony. • Extract out the Harmony data. • Import the Harmony data into the game engine. Keep in mind, if you’re working with a custom engine, you can also process the Harmony data that’s exported and use it in a custom game engine. If you need assistance with adapting data for your engine, contact store.toonboom.com/contact/support. If you’re making a game for consoles, like the PS or Xbox, then you have the freedom to create larger textures. You may want to animate frame-by-frame, or you may want to animate with a cut-out character. If you're simply going to export on a frame-by-frame sequence, then you can use all tool in Harmony without limitations. You can then process an exported image sequence into a sprite sheet. Raw game data export is appropriate when you want the file sizes to be as small as possible. 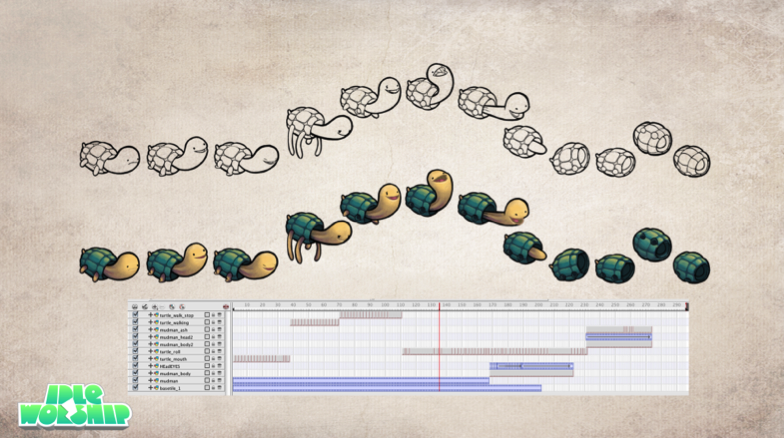 Toon Boom lets you extract all the data from Harmony to incorporate into a game engine. You can extract the skeleton information, drawing information, and keyframe animation data, as well as deformations (bones and articulations only), cutter, transparency nodes, and timing columns. • Advantage: This is the lightest export, and will keep file sizes small which is ideal for mobile applications. • Disadvantage: You are somewhat limited in the tools you can use in Harmony. You can use tools like Morphing as well as Curve and Envelope deformers, but you’ll need to bake it out to drawings so they're interpreted properly in the game engine. You can use Cutter effects (masking), but you cannot cascade them, meaning you cannot have more than one in a hierarchy chain. 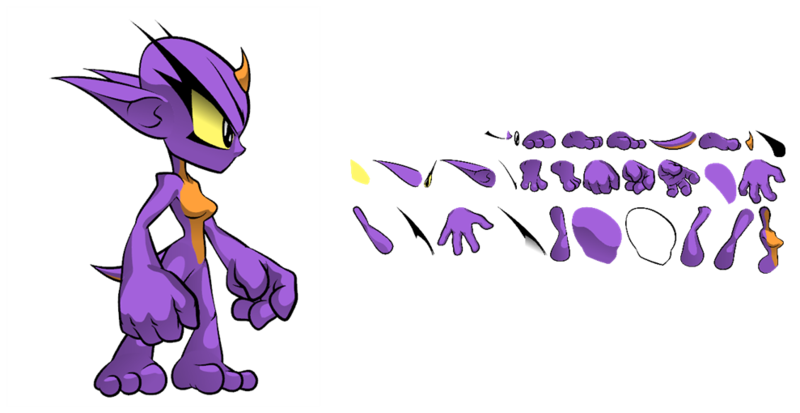 The Game Bone deformers can be used on your rig with having to bake it to drawings. However, even with these limitations, you can create really great cut-out character animation in Harmony and extract all the data. By moving, rotating, scaling, and skewing the different drawing layers, you can create advanced looking animation. When you extract the data, you'll have sprite sheets that contain only the drawings of the body parts used in your Harmony scene file. 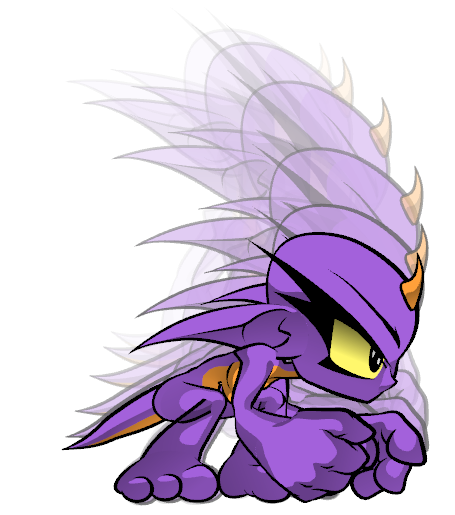 You can also support multiple animations, such as idle, run, and jump, and reuse the same skeleton and drawings when possible by simply exporting new animation data. Toon Boom has fully integrated this solution with the Unity game development rendering engine. If you are creating your game in Unity, you have a seamless pipeline without the need to re-treat the data in your game engine. You can export from Harmony using an image sequence, which can be recompiled into a sprite sheet. Advantage: You can use any of the tools in Harmony when you animate! Disadvantage: These sprite sheets can become quite heavy and end up as large textures to process in the game. This may be fine for many games, like console games, but when you’re doing game development for mobile devices, such as iOS or Android, you need to be very light on your texture space. Also, file sizes should be kept under 50 MB to facilitate downloading without needing to be connected to Wi-Fi. To export to EaselJS, you need to add the script in the Scripting toolbar (TB_ExportToEaselJS). This script is included in Harmony. See Export Animations to Unity on page 1 for more information on how to add the script to your Scripting toolbar and the interface parameters.